A Haverhill man tangled up in the city’s so-called “gang war” dating back to 2016’s Swasey Field shooting has been arrested and charged with new firearms offenses, State Police said last week. Mario Acosta, 23, was arrested by Trooper Steven Hanafin Wednesday night in Lawrence after being pulled over for marked lane violations, police said in a statement. Behind the wheel of a yellow BMW sedan with illegally tinted windows, Acosta and a 17-year-old female passenger were observed making “strange movements” that put Hanafin on alert. 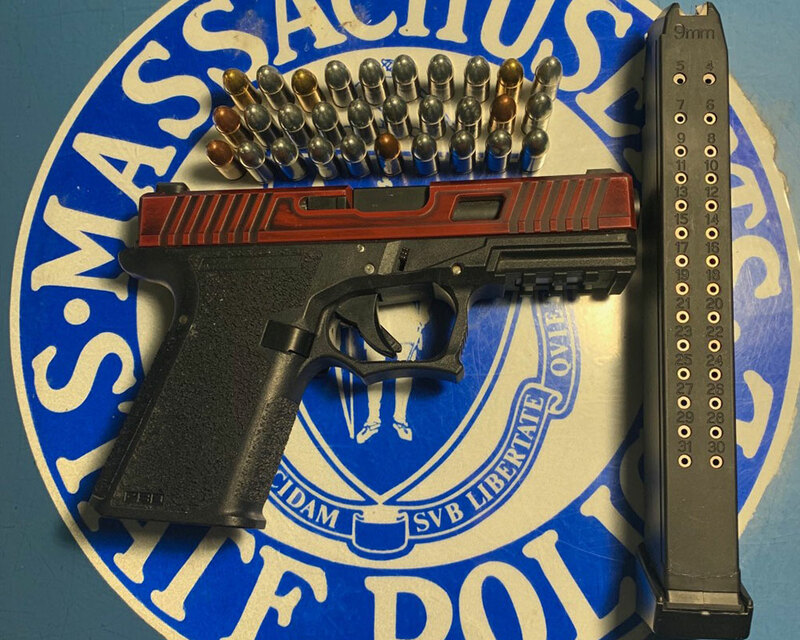 During the traffic stop, police located and seized a Polymer80 9mm handgun and an illegal extended high-capacity magazine loaded with 30 rounds of ammunition. While the juvenile was arraigned in Essex County Juvenile Court, Acosta faced a judge in Lawrence District Court, answering to several charges including possession of a firearm, and possession of ammunition without an ID card. Bail was set at $25,000. Acosta’s arrest took place just shy of the 11-month anniversary of the drive-by shooting death of Nike Colon in Haverhill’s Mount Washington neighborhood. As WHAV has long reported, Colon’s May 17, 2018 murder and the arrest of his accused killer Eddy Almonte, ties together a series of events and retaliations seemingly kicked off by the May 2016 shooting at Swasey Field. Two people survived gunshot wounds during a gang-involved shooting at Swasey in May 2016, while no injuries were reported after shots were fired by rival gang members in a retaliatory Temple Street strike weeks later. Haverhill Police later confirmed Almonte and Acosta, along with Juan Marte, were involved in the Temple Street gunfire. The case against Colon’s alleged killer Almonte is progressing at the Superior Court level.